A small area within modern Carmarthenshire comprising the generally steep-sided valleys of Nant Bargod and its tributaries, Nant Esgair and Nant Brân. Its character has chiefly been shaped by the 19th century woollen industry. The area lay within the medieval Cantref Emlyn, in Emlyn Uwch-Cych commote. Cantref Emlyn had been partly brought under Anglo-Norman control in c.1100 when Emlyn Is-Cych commote, to the west, was reconstituted as the Lordship of Cilgerran. Numerous castles were established in Uwch-Cych - none of which has any recorded history - but the commote was back under Welsh control by the 1130s, and remained as such throughout the 12th- and early 13th centuries. The commote was appropriated by the Anglo-Norman Marshal Earls of Pembroke in 1223, but was granted to Maredudd ap Rhys, with whose family it remained until it was finally annexed by the English crown in 1283. It formed part of the Hundred of Elvet in Carmarthenshire in 1536, when Is-Cych joined Pembrokeshire. Uwch-Cych was granted to royal favourite Sir Rhys ap Thomas in the late 15th century, reverting to the crown in 1525, to be then granted in 1546 to Sir Thomas Jones of Haroldston, Pembrokeshire. It remained in this family for several generations, eventually passing by marriage to the Vaughans’ Golden Grove Estate, which in the 19th century still owned almost all the land on the southern side of the Teifi from Pentre-cwrt in the east to Cenarth in the west. The medieval Welsh tenurial pattern - with neither vills nor knight’s fees - has been largely responsible for the dispersed settlement within the region. Indeed little settlement appears to have occurred within the Drefach-Felindre character area prior to the late 18th century, although medieval settlements were recorded at Cringae, now a farm, and at ‘Aberbargod’. As cloth was produced in many locations in southwest Wales during the medieval and early modern periods, it is likely that it was also produced at Drefach-Felindre, and the mill at Cringae in the 14th century may have been a fulling-mill. A small chapel-of-ease to Penboyr parish had been founded, within what was to become Felindre, by the early 18th century. Possibly a post-medieval foundation, Holy Trinity Chapel, also known as Capel Bach, was ‘dilapidated’ in 1750 and it was eventually replaced by St Barnabas’ Church in 1862. What is not clear is why during the course of the 19th century Drefach-Felindre became pre-eminent in woollen cloth production in Wales, leading to its appellation ‘the Huddersfield of Wales’. In the late 18th century four fulling mills at Pentre-cwrt, Dolwyon, Drefach and Cwmpencraig were established; other functions were carried out by hand, on a domestic basis or in small workshops. Carding factories were in production at Cwmpencraig and Dolwyon by the 1820s, and later factories had spinning machines. Concomitant with the increase in cloth production was the growth of settlements. In 1776 Felindre was just a few houses called Velindre Shinkin but by the tithe survey of c.1840 it had grown to a village of c. 20 houses. Drefach had about 20 houses and Drefelin 7 houses. No settlement is recorded at Waungilwen on the tithe map. Indeed the area of the latter village was common land, and it seems likely that the settlement originated with squatters illegally constructing houses. A similar process seems to have happened at Cwmhiraeth. The introduction of the power loom in the 1850s and greater reliance on water power and other power sources at a later date led to an expansion of the industry, with substantial mills (some employing 50-100 people) constructed at Drefach, Felindre, Drefelin, Cwmpengraig, Cwmhiraeth and Pentre-cwrt by the first decade of the 20th century. Settlement expanded to accommodate workers and other personnel, and it is the peak decades of the industry from 1880 to 1910 that have largely shaped the historic landscape. It is during this period that the population centres of Drefach and Felindre, with their worker houses, mill owner houses, shops, church and other places of worship were firmly established, as were secondary settlements such as Cwmpencraig and Cwmhiraeth, with their factories, mill owner houses, worker houses, and chapels clustered on narrow valley floors. The decline of the woollen industry from the 1920s is reflected in the historic landscape as few houses or other buildings date to the mid 20th century. However, late 20th century housing, particular linear development, has linked some of the former separate settlements, such as Drefach and Felindre with Waungilwen. Small industrial settlements unite this oddly shaped historic character area. Its centre lies at approximately 50m above sea level at the confluence of Nant Bargod, Nant Esgair and Nant Brân where the steep-sided valleys of these north-flowing streams open out into the Teifi Valley, but it also includes upstream settlements and fields on the narrow valley floors rising to 90m above sea level. The motive power provided by these streams was a prime reason for the growth of the woollen industry, and neither the factories nor the associated settlements have expanded far from the valley floor. Up to the mid 20th century the villages and hamlets constituting this character area maintained a degree of physical separation, although united in function and character, but since then residential development has joined the two main settlements – Drefach and Felindre – with Waungilwen. The hamlets of Drefelin, Cwmpengraig, Cwmhiraeth and Glyn-teg, lying in the steep-sided valleys, have experienced less recent development and have maintained their individual character. The villages and hamlets are linear, spreading along the valley floors or alongside roads. There is now no particular focus to these settlements, and former clustering of houses around individual mills or other buildings such as chapels has been subsumed into the overall settlement pattern. Drefach is the largest village and is described first as it contains most of the elements that can also be seen in the other villages and hamlets. This is overwhelmingly a 19th century industrial settlement. Mills here range from substantial two storey structures of stone and brick such as the integrated Cambrian Mills (now part of the National Museum and Galleries of Wales) mainly built in the first decade of the 20th century, to weaving sheds/workshops attached to houses or incorporated into them as attics or upper storeys, such as Pantglas and Llwynbrain House (these houses and the Cambrian Mills are listed). Other listed buildings at Drefach comprise a mid 19th century chapel, mills and large, detached, late 19th century houses of the middle classes and mill owners, such as Greenfield, Bargoed Villa and Meiros Hall. Most houses are not listed and consist of 19th century worker houses. Many styles are present, but two-storey terraces with little architectural pretension predominate, with both single period - single style terraces and mixed style – multi build terraces. They are probably the result of housing provision by mill owners or speculative building by landowners. Most lie in the broad Georgian vernacular tradition, with relatively large sash windows and symmetrically arranged facades. Some Gothic detailing is present on some dwellings and a row of mid-18th century two-storey vernacular cottages lies in the centre of the village. Stone – both locally-sourced and Teifi valley slate - is the dominant building material. Teifi valley slate is cut and laid in courses on the larger houses, such as Greenfield, but more commonly stone is used as uncoursed rubble on workers cottages and other buildings. The use of yellow brick and to a lesser extent red brick for door and window jambs and voussoirs provides a distinct character to many buildings. Shaped stone voussoirs are also present. Cement render with colour-wash is also common, particularly on early 20th century buildings.Some of these may be of brick, although the use of brick for the entire building prior to the early 20th century is not common. Commercially cut north Wales slate is ubiquitous. Development continued throughout the 20th century, with examples of 1930 to 1950 suburban style houses on the outskirts of the village and infilling vacant spaces within the village itself. 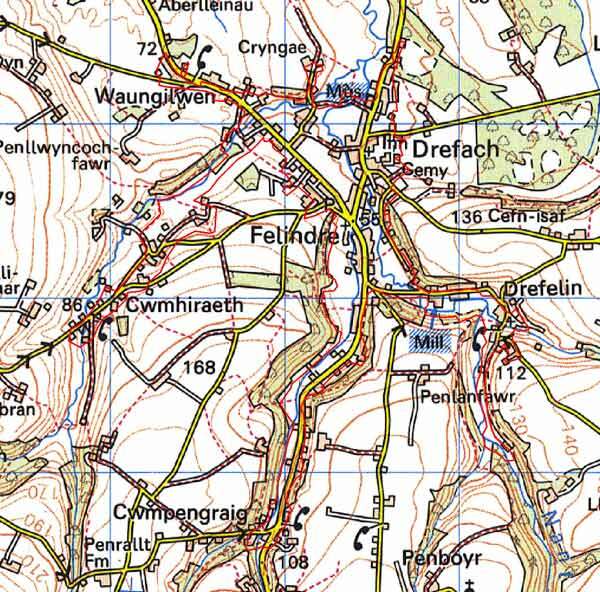 House building continues today, and the village of Drefach is now linked to Felindre by 20th century bungalows and houses. Felindre shares many of the characteristics of Drefach. It has listed woollen mills, terraced worker houses and larger middle class or mill owner houses. St Barnabas’, the communities’ Anglican church which is in mid-19th century gothic style, and the 19th century school, are located here. An early chapel at Felindre, Capel Pen-rhiw, was converted from a barn in 1777. A classic of the ‘primitive’ type of chapel architecture, it was moved to the Museum of Welsh Life at St Fagans in the late 20th century. Velindre House opposite the church may have 18th century origins, in which case it predates other buildings in the area, although externally it appears to be a rubble built two- storey 19th century house. 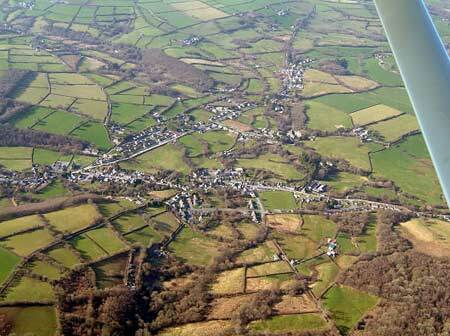 As with Drefach late 20th century linear development links the village with that of its neighbours. 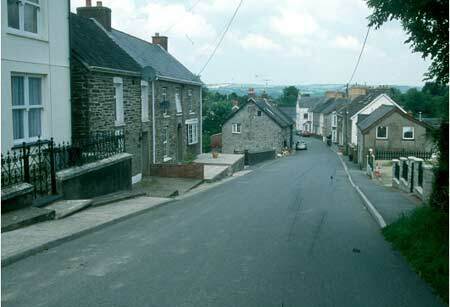 The oldest part of Waungilwen consists of terraces of 19th century vernacular terraced worker houses and detached worker houses, including some single storey cottages. Drefelin has a listed stone built mill, on the site of an older mill, and a terrace of 19th century worker houses running along the valley floor. Further up the valley at Glyn-teg is a 19th century chapel, a farm and a short terrace of 19th century single storey worker cottages. Squeezed into the narrow valley floor at Cwnpengraig is a chapel, woollen mill and worker house, all of 19th century date. Cwmhiraeth is similarly confined. Here there is a loose cluster of 19th century two storey worker houses – detached, semi-detached and short terraces – single storey cottages and small-holdings and a three-storey disused mill. Teifi valley slate is the dominant building material. There is also a scatter of modern bungalows and houses. Within or alongside the fields of the valley floor, between the villages and hamlets, are other isolated mills, cottages, worker houses, mill owners’ houses, which almost all date to the later 19th century. Although predominantly domestic in appearance, many of these dwellings have weaving sheds or workshops attached to them, although most are now in a derelict condition. Of the 115 recorded archaeological sites in this area, the vast majority are buildings and structures as described above, with others relating to the woollen industry such as mill leats and ponds. There is very little pre 19th century recorded archaeology, and what there is – three holy wells – do not greatly characterise the area. The tight grouping of buildings constructed from local stone in a broadly similar architectural style within a very short period from 1870 to 1910 provides a strong historic landscape character for Drefach – Felindre. It is therefore a very distinct historic landscape area, and contrasts with the woodland and farmland of neighbouring areas. However, many of the architectural traits – use of Teifi valley slate, a late 19th century style - of the industrial buildings are paralleled in the agricultural buildings of the neighbourhood.